In this new and updated VPN Unlimited review, I put the service through extensive testing to identify any problems with speeds, data leaks, features, and connection stability. While VPN Unlimited has improved since the last review, I still found various issues with both the Mac OS and Windows VPN clients that expose the user’s real IP address. Speeds were also somewhat disappointing with servers in the United States. Also concerning is VPN Unlimited’s data collection policies, which we’ll cover in detail below. Even though it performed slightly better with the latest review update, VPN Unlimited still does not earn a recommendation or a spot on the best VPN list based on the latest test results. 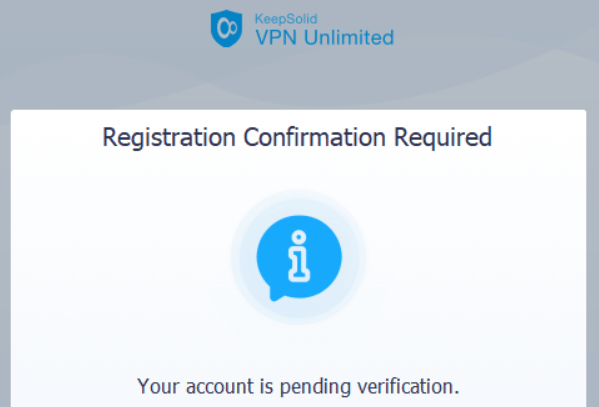 The company behind VPN Unlimited is KeepSolid Inc. KeepSolid Inc. offers a variety of digital products and is based in the United States. As we’ve discussed before, the United States is generally considered to be a bad jurisdiction for VPN services. This is mainly due to unfavorable surveillance laws and practices (see Five Eyes). While there are many good options if you need a VPN for USA, I would not recommend a VPN that is based in the US. There is not too much information about the company or people behind these products. 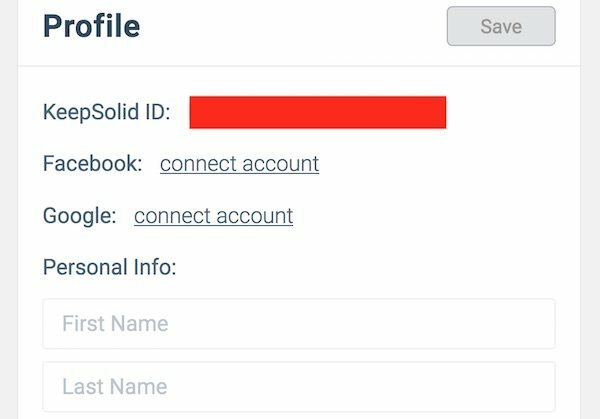 When chatting with support, I was told that KeepSolid is technically a USA company, but with staff also working out of Ukraine. 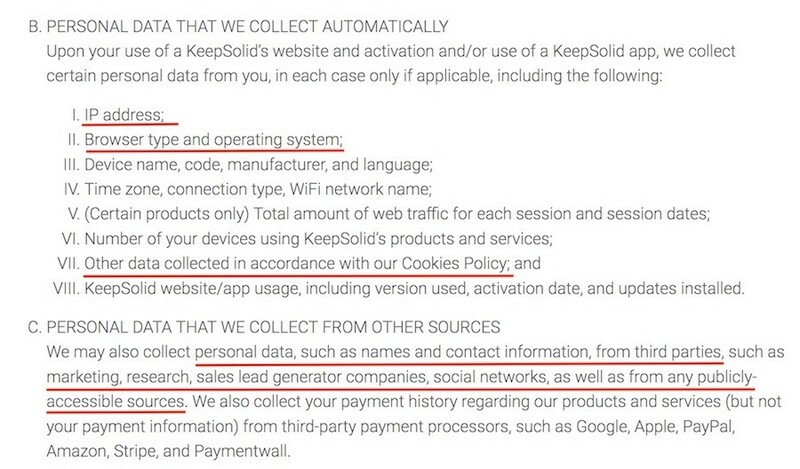 KeepSolid is a company that collects lots of data. While KeepSolid is based in the United States, data sent overseas could be used for a variety of different purposes that the end user may find alarming. This is why the less data a VPN collects, the better. Based on these data collection policies alone, I would not recommend VPN Unlimited due to privacy concerns. If you are looking for a no logs VPN provider, there are certainly some better options to consider. You can see that they are offering a “lifetime” subscription plan for about $200. As discussed in the VPN scams guide, the “lifetime” subscription is not the lifetime of the user, but instead the lifetime of the VPN provider – however long it manages to stay in business. There have been various cases of “lifetime” VPN services closing shop and running with the money, or converting all “lifetime” accounts to recurring subscriptions after a few years. While good VPN services can be rather pricey, there are special offers and discounts discussed in the VPN coupons guide. For example, you can see the NordVPN coupon and also the ExpressVPN coupon, which are two VPNs that did better in testing. Payment options: VPN Unlimited offers a nice variety of payment options, including all major credit cards, PayPal, Amazon, Bitcoin, and also gift cards. If you are not completely satisfied with the applicable Service during the free trial, we will refund the applicable Fee to you if you cancel no later than the last day of the free trial. For this VPN Unlimited review, I tested out the Windows and Mac OS applications. Overall the Windows client was easy to use, but it had some flaws, which we’ll cover more below. I also tested the updated Mac OS client for this review. It felt a bit clunky compared to the Windows client, and it also had issues with IPv6 leaks and kill switch errors (as we’ll cover further below). Just like with the Windows app, the VPN Unlimited Mac OS app had issues with the kill switch. It is not a VPN for Mac that I’d recommend. The “KeepSolid Wise” protocol is just an obfuscation feature, which is sometimes used if VPNs are being actively blocked. This may be the case if you are using a VPN for China or with work or school networks that don’t allow VPNs. I then went back to my email and attempted to go through the confirmation process, but the link was broken and I could not be authenticated. This essentially locked me out of using the VPN I had just signed up for. There was no option to resend the confirmation email and the existing link was broken. Eventually I was able to reach someone from support who had to manually approve the account before I could even use the VPN. 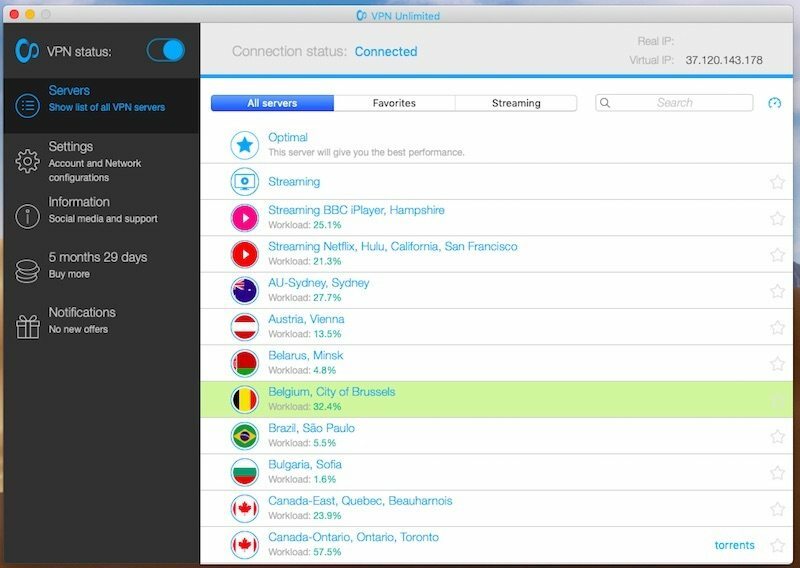 For this VPN Unlimited review, I ran different speed tests using servers in Europe, the United States, and Canada. While some nearby servers in Europe offered OK speeds, servers further away in the US and Canada did not perform very well (even considering the longer distances). All tests were conducted using a 100 Mbps ethernet connection from my physical location in Europe. Nearby servers in Europe offered decent speeds, although nowhere close to my baseline speed. Here I’m testing a nearby server in Paris, France, but my speed was reduced down to only 45 Mbps. For nearby servers, these speeds are far from ideal. With ExpressVPN, for example, I was able to get over 90 Mbps with all nearby servers in Europe. Similarly, NordVPN also provided excellent speeds with all nearby (Europe) servers. I also ran some tests with servers in the US and Canada. While performance has improved over the previous VPN Unlimited review, there is still al long way to go. Now we’ll take a look at some of the leak tests. Does VPN Unlimited still leak user data? In previous reviews, I found VPN Unlimited apps to have serious security and privacy flaws with leaking data. Since then, the VPN Unlimited support staff informed me that they updated the applications to improve leak protection settings. Now let’s see the results. However, it’s important to note in the example above, I was testing for leaks with an active and stable connection. 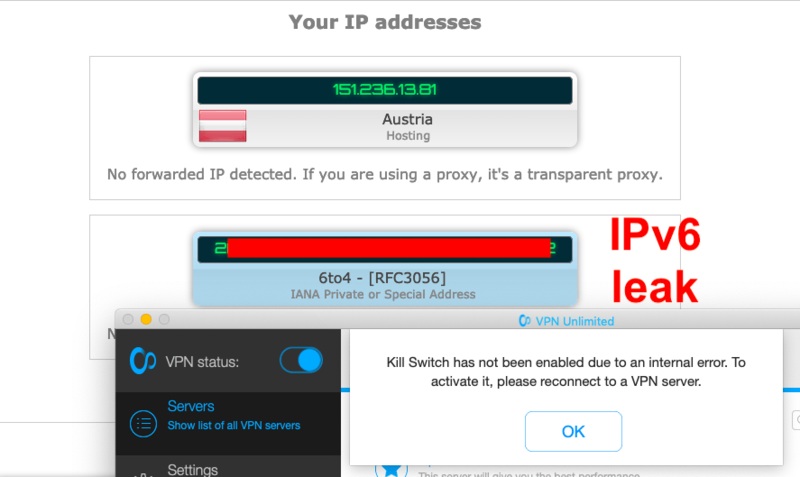 Unfortunately, most VPNs leak when reconnecting and/or switching servers, and this is also what I found with VPN Unlimited. The big issue with the Windows client was the kill switch, which we’ll explain further below. Reconnecting to the server did not fix the error, and the IPv6 leaks persisted, with the kill switch error message. When I wasn’t getting the kill switch error messages, I did not identify any leaks. If you are a Mac OS user, I would not recommend VPN Unlimited due to these issues. See the best VPN for Mac guide for alternatives. One key feature to keeping your data safe is a kill switch that effectively blocks traffic. 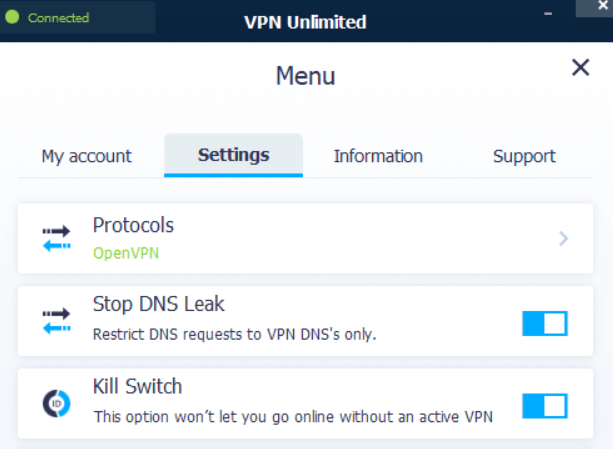 VPN Unlimited informed me they had released new VPN clients that incorporated a kill switch to block non-VPN traffic and stop any leaks. When switching servers, I found the kill switch would simply not work for a few seconds, thereby letting unencrypted traffic out of the VPN and exposing my real IP address. This is a serious flaw and essentially renders the kill switch feature (and VPN) useless. Here you can see my real IPv4 address being exposed when I was in the process of connecting to a different VPN server. I also found that when switching VPN protocols, the kill switch was not effective in blocking traffic, thereby exposing my real IP address. I found the same issues with the Mac OS client, in addition to the errors noted above that would expose my real IPv6 address, even when connected to a VPN server. Now that we’ve covered the test results, we’ll take a closer look at the VPN service. At the time of this review, torrenting and file-sharing are only allowed on designated P2P servers. Torrenting is only allowed on five servers. While restricting torrenting to designated servers is not out of the ordinary, it’s also not ideal. This restricts people who want to torrent and also results in the few torrenting servers having more bandwidth consumption. While VPN Unlimited has not worked well with Netflix in the past, it did work when tested for this review. VPN Unlimited has a dedicated Netflix VPN server in San Francisco, California (USA). I was able to connect to the server and stream Netflix without any issues. The main drawback, however, is that the speeds were rather slow, as pointed out above (around 4 Mbps download speed). Another drawback is that there appears to be only one server that works with Netflix. If Netflix were to start blocking this server location, there does not appear to be any backup options in place (unlike some other Netflix VPN services). If you are looking for a VPN to unblock Netflix, VPN Unlimited may be a decent choice, but since there’s only one streaming location, it is not ideal. You can also check out the Netflix VPN guide for additional options. The speeds with VPN Unlimited are decent, and an improvement over the past review. Nonetheless, they are much slower in comparison to other top-rated VPN services I’ve tested. 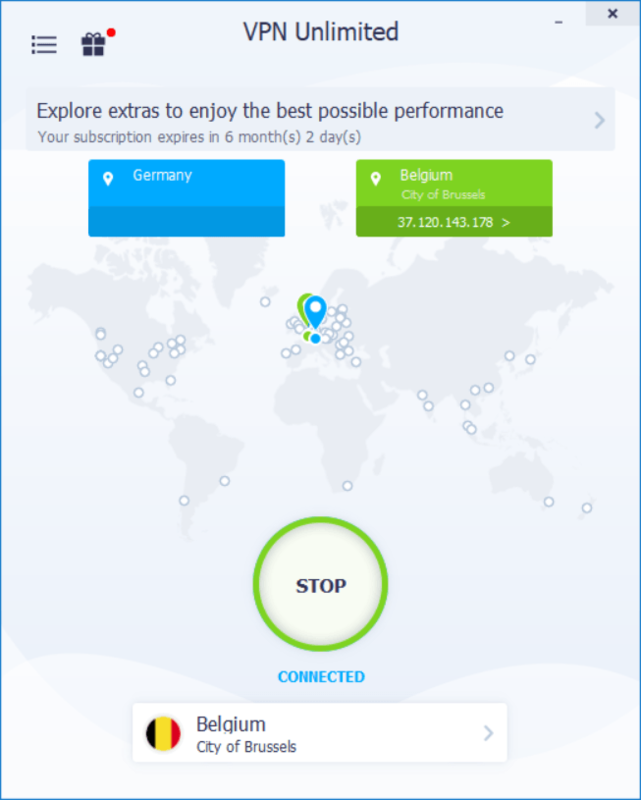 While the prices are somewhat cheap, you can still find other cheap VPN services that performed better in testing, such as NordVPN with the 75% discount coupon. If you have used VPN Unlimited, feel free to share your review below. And if you’re open to alternatives, check out the best VPN report for the latest recommendations. VPNUnlimited for mac does have OpenVPN along with many more protocols. Can’t say for the rest of this review – but I find the service fine. The review is now updated to reflect the OpenVPN Mac OS client. I am seeing completely different results. I get over 177Mbps using a server across the country in San Jose (similar results from other servers, slightly better for more local), and using the tools you use shows no DNS leaks at all here (this is on Mac OS X). My only complaint has been the DNS performance resolving certain sites in China. During VPN Unlimited setup (MacOS 10.13.6) one is prompted for the keychain password. I am not an expert … but this seems like giving a key to my whole house even though access is needed to a specific room only. Should this be a concern …. or is it a normal procedure to share one’s keychain password? Hi Tom, you can check out the Static IP VPN guide for more options. Bad Service – slow speeds, throttled my true 1GB Up, 1GB Down speeds to less than 70 MB Down and 15 MB Up. 7 Day free trial isn’t a real thing – when you first log in the service ends your trial period and gives a *free gift extension* of 7 days instead. They will not refund you if you ask to be deleted from their database, as well (it’s a term of their service) – the only reasonable conclusion I can come to is that they want to sell the information to someone, so your deletion of the info takes away their financial incentives. Not really a technical comment. The review states that KeepSolid is based in the U.S. However, I thought it was based in Ukraine (and that’s where the helpful technical support folks are). Please explain. I believe KeepSolid is a US division, and the main company is overseas. I tried to see if there are any leaks and no problem at all. Speeds are ok in general especially when connected to the local servers of my country. I am not using torrent but I did some tests to see speed and they are ok if the server load is not too much. It’s ok for the 55$ that I paid from stack social for 10 devices for lifetime (even if it is only just for a couple of years is fine too). I have found the same. iOS has Open VPN options and the website shows Mac OS does. It also does not leak, has a kill switch, and stays active when the device is in sleep mode. I hope the reviewer will change some of the information and retest the service. I disagree about Sven’s lifetime service comments. As long as the majority of their customers are not lifetime service subscribers, they amount to extra money and potentially positive advertising. Thank you for the review. We realy appreciate the critics’ feedback as it often is an in-depth one and thorough. However, we’d like to let you know some poins mentioned here had been recently improved a, and even a while ago. – IPv6 leaks. These can happen if your network uses IPv6 protocol (which is currently not that wide-spread). To check if that’s the case for you, go to https://ip6.nl/ and see if it shows numbers in the IPv6 section. If not – you’re good! If you happen to have the connectivity, we suggest you disable IPv6 in your system following these guides for Windows and Mac. – DNS leaks. When such a leak occurs, third parties might be able to track the websites you’ve visited. Luckily, most platforms come equipped with anti-DNS leaks protection, with Windows being the only major exception. No worries though, as we have developed our own defense technology for this platform. Just visit the Account section and enable the stop DNS leaks option. – WebRTC leaks. As a result of certain browser vulnerabilities, your IP may get “remembered” by them and thus – exposed. There are two ways to avoid this using VPN Unlimited. First, you can install VPN to your WiFi router so that browsers will only see the VPN’s IP, not yours. 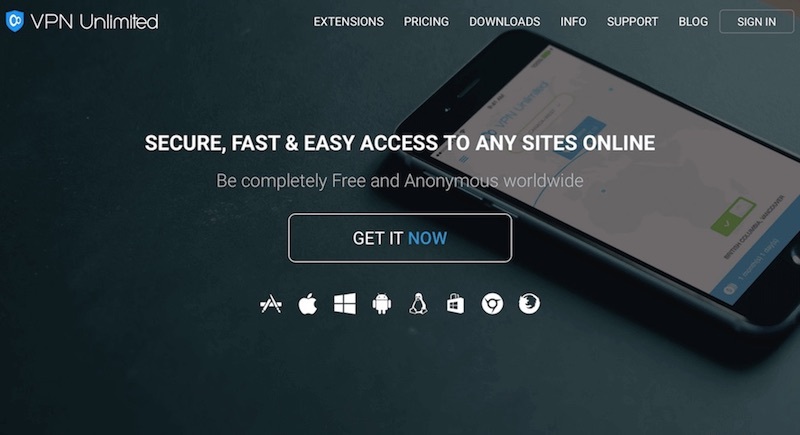 Or, you can simply download VPN Unlimited browser extension that has a built-in protection against WebRTC leaks. VPN Unlimited works with Netflix, Hulu, and BBC iPlayer. I found your review both surprising and disappointing, since I have a lifetime license for VPN Unlimited (although I got it at a huge discount below what is currently available on the website… $39, I believe) and I have been fairly happy with it. After reading your review I ran the tests at ipleak.net and no issues were found for the tests for IPv4, WebRTC, DNS Address, Torrent Address (I don’t believe that I have IPv6 turned on, and it returned “IPv6 test not reachable.” for that portion of the test), and Geolocation. In each case, it reported back the IP address and/or physical location for the server in northern California I’m currently connected to using VPN Unlimited. As far as settings, I have the option within the program for “Stop DNS Leak” turned on, as you did. And I selected “OpenVPN” as my protocol, which is described as “high performance & data protection” (as opposed to the “ultimate security, but medium performance” of the other 2 available protocols). As you stated in your review, your test results are based on the conditions for the specific date and version you tested (my guess is it was either 4.15 or 4.16, as 4.17 came out in the last few weeks). Any idea why our results are so divergent? Do you have plans to retest VPN Unlimited anytime soon? One other quick note: VPN Unlimited now offers servers specifically for general streaming, Netflix & Hulu streaming, and BBC iPlayer, although I haven’t tried any of them so can’t speak to how well they work. I signed up with VPN Unlimited because they were virtually the only ones with an app for my Windows Phone 8.1, but their servers, at least in the US, are among the “dirtiest” I’ve encountered. Several US sites refuse to let me connect if I’m using one of their US servers. When I raised this problem with their support they said I should buy a private server from them. That would restrict me to a single IP, so not an option for me. I wish I would have read your review on VPN Unlimited prior to signing up for their service. Instead I relied on Max Eddy’s review in PC Mag. What a dolt. Daily blocks to my account due to unauthorized attempts by unknown person, can’t log in due to wrong password, but when I update it, it occurs again the next day. Difficulty connecting to their servers and frequent server disconnects. And as you stated in your article, VPN Unlimited doesn’t provide protection for IPv6, so have to turn it off to stop the leak. Horrible, horrible, horrible. I’ve filed a complaint with the BBB.